When I drink I tend to get a little touchy. That's OK with a DS, but the ladies used to get mighty angry. While some might disagree, there's a lot of fun to be had at the bottom of a bottle. Of course, streaking and keg stands are one example of said fun, but what about something for those who are a little more reserved? Someone reserved like, the "cool" guy who's relaxing in the corner, nursing a whiskey, and has nothing more than a pocket of change to keep him company. For that guy, fun comes in the form of the neon-induced reverie of Touchmaster. Midway's staple mini-game collection has been littered across bars all over the country for years, and chances are if you've spent your time on a stool, you've played it. Touchmaster is one of the last machines in the Midway arcade division that's still raking in the profits, and in a tried-and-true marketing move, it seems Midway's comfortable with taking that success and bringing it over to the handheld market. Touchmaster's mini-games are coming to the Nintendo DS, 23 in all, and they're hoping to find a new fanbase. The bar favorites included in the package are: Gem Slide, Crystal Balls, Hot Hoops, MahKi, Mah Jonng Pairs, Pond Kings, Pairs, Target 21, 3 Peak Deluxe, Pyramid 13, Power Cell, Solitaire, Artifact, 5 Star General, Double Take, Go Wild, Up Lift, Times Square, Word Search, Triple Elevens, Trivia, Pick Up Six, and Wordz. Some of the games probably sound familiar, such as Word Search, Trivia, Mah Jongg, and Solitaire, but others are cleverly titled renditions of popular classic games. Pond Kings is a version of Checkers, and 5 Star General is best described as Yahtzee. 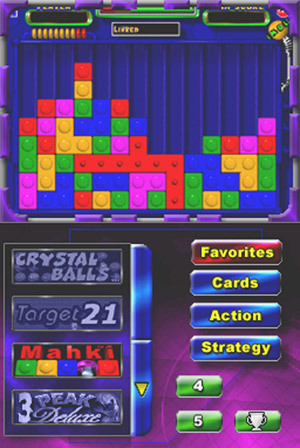 Other games in the package could be called simple puzzle or casual games to those who haven't had the opportunity to play Touchmaster before. Porting Touchmaster to the DS could have been one of the simplest game creation endeavors any company ever had to face if it weren't for the inclusion of Nintendo's Wi-Fi service for high score lists, leaderboards, daily leaderboards, and future tournaments. 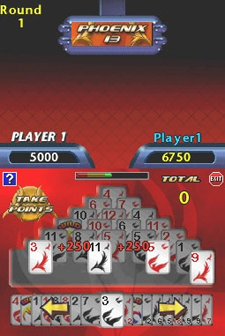 The games maintain their original touchscreen functions as well as their original visuals. Nothing too flashy is ever present in the game, but that shouldn't be held as a particularly negative outlook, as Nintendo's own Clubhouse Games took the same route and turned out splendid. Clubhouse Games might be Touchmaster's biggest rival in the casual game collection grouping for DS, as it also brings true online play to the mix, but the differences between both games should allow for them to co-exist; the DS definitely isn't a one-big-dog kind of town. It's a shame, however, that Nintendo wasn't willing to include Touchmaster on the Touch Generations lineup, as that should have, if nothing else, helped Midway pick up some extra sales and boosted the number of games that Nintendo could boast to the non-gamers about. While a collection like this is always something to keep an eye out for, it does have a much smaller amount of possible playing opportunities than Clubhouse Games, and it unfortunately doesn't have the budget price-tag that would make it an easy purchase. If this seems like something that is up your alley, luckily you're more than welcome to head down to the pub and technically hop-on a full preview build. Only if you're of the legal age of course, Modojo takes no responsibility for underage drinkers. Not after we accidentally wrecked that school bus while lil' Timmy and cohorts howled in drunken glee. When, and if, we nab a review copy of Touchmaster expect us to handle the game in the only true way it should be covered: A frothy brew in one hand, a stylus in the other, and a desperate need to use the bathroom no less than three times an hour. We're thinking if playtime is sufficient (and the drinks keep flowing), a 5 out of 5 score is pretty much guaranteed.